Magic Sand Escape is a new Point’n’Click Adventure game from Esklavos created by Federico Rutenberg. 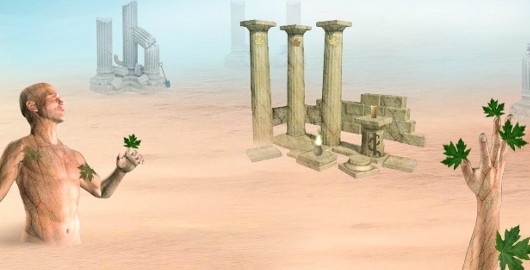 Search for clues and solve puzzles to find the four keys to escape from this sandy ruin. Take SHOVEL and CACTUS PIECE 1 from the background on the left. Notice the three pillars. One is missing a yellow leaf. There’s also a candle with a strange glyph under it and a fire. Go right. Take CACTUS PIECE 2 by the gate. Dig up the sand pile to get a STICK. There’s a candle by the gate, a cactus with no branches, a stopped hourglass, and of course, a panel at the top of the gate where we’ll need to put in a pattern. Go right. Dig up the sand pile to get a RAG. Pick up the last 3 CACTUS PIECES (bottom corners and the middle of the right side). There are two more candles here, a locked trunk, and a book. The book gives you a CANDLE CODE. It also has the PIXEL PICTURE for the top of the gate and a YELLOW LEAF. Enter the mushroom picture above the gate for the RED KEY. Put the leaf in the middle column (in the first scene) for the BLUE KEY. Put the cactus pieces on the cactus in scene 2, then go back to scene 1 and look at the strange picture again. It’s a CACTUS CLUE. Make the cactus match the clue (from the top: down, down, up, up, down) and get the WHITE KEY. Combine the rag with the stick (by clicking the “+” button then the two items) to get a TORCH, then light it from the fire. Light the candles in order (ruins – scene 1, barrels – scene 3 left, portal – scene 2, desk – scene 3 right), then put them out (deselect the torch, then click on them) in the same order to get a YELLOW KEY. As usual, put all the keys in their holes to activate the magic portal and escape. Posted on Saturday, September 21st, 2013. Follow any responses through the RSS 2.0 feed.